Acupuncture has been a trusted treatment modality for more than 4000 years. Originating in China, it is classified as an alternative solution to relieving pain, discomfort and improving the body’s energy flow. 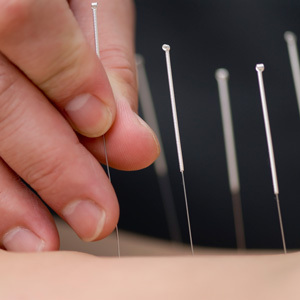 At Perth Sports Injury Clinic, we provide a medical form of acupuncture known as dry needling that addresses localised issues in the muscle fibres rather than emphasising the flow of energy. The treatment is referred to as dry needling, as the needles used are not hollow and no fluid will be injected into your body. Dry needing was developed in the last few decades. It is used by Chiropractors, Physiotherapists and more to stimulate the body’s self-healing response. Needles are inserted through the skin to the muscle fibres, creating a mild inflammatory reaction. In turn, blood circulation to the site increases, bringing much-needed oxygen and promoting your healing. Our trained practitioner identifies trigger points, which are hard, tight, tender, lumpy or gritty areas in your muscles. A fine needle is inserted near this trigger point and left in place for a few minutes. The muscle may twitch or spasm while the treatment occurs. The goal is releasing muscle tension, reducing pain and assisting muscles in returning to normal function. It’s important to note that dry needling has associated risks including localised bruising, soreness and bleeding. These risks are temporary, and if you have any concerns about treatment, don’t hesitate to contact us.